As part of its philanthropy outreach, AITC supports the mission of Operation Giveback (OGB), whose mission is to raise awareness and resources for America’s wounded warriors, their families and children of our fallen heroes. In an effort to provide support for this mission, OGB facilitates events and special opportunities across the country to generate needed funding to help these members and their families, as an opportunity to “give back” from the community. 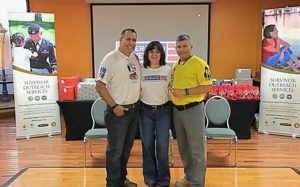 On January 5th in Puerto Rico at Fort Buchanan, AITC President & CEO, Gabe Ruiz and his wife Sandra, CFO, presented a check to help provide Christmas gifts for military orphans identified in OGB’s program as part of the Three Kings Day annual celebration on the island. “AITC is proud to support Operation Giveback’s efforts to help the children of our fallen heroes. We recognize that our heroes have served our country with pride, distinction, and honor and in some cases paid the ultimate price. It is our pleasure to present a financial donation to help purchase the gifts on the wish lists of these children. While we cannot replace the ultimate sacrifice of losing their parent, we can in some small way, bring joy and hope to help make their holiday special this year,” says Ruiz, AITC’S President & CEO. The link for YouTube shows the excitement of the children whose lives are forever touched by the generosity of individuals and companies like AITC. For more information and to help the OGB cause, please contact Jose Garcia Aponte via email at info@ogb1.org or visit the OGB website.